There’s still time for grilling, and this is a winner. It’s been the hit of many a summer grill party. The recipe comes from The Silver Palate Good Times Cookbook by Julee Rosso and Sheila Lukins, two women who had a gourmet food shop in NYC (now an online store) and wrote several cookbooks back in the ’80s. I have three of their books, now well worn and the source of many excellent recipes. Combine wine, soy sauce, garlic, mint, rosemary and pepper. Put lamb in resealable plastic bag and pour marinade over meat. Refrigerate for 6 hours or overnight — but not longer. Prepare grill. My grill master uses a gas grill, but the recipe mentions a charcoal grill — whatever works for you. Drain meat but reserve marinade. According to the recipe, the lamb is to be grilled 4 inches from hot coals about 20 minutes on each side, but checked for doneness after 30 minutes. On the gas grill (covered) we have found 10 to 12 minutes per side is enough. Lamb is best served rose (pink) — not well done. 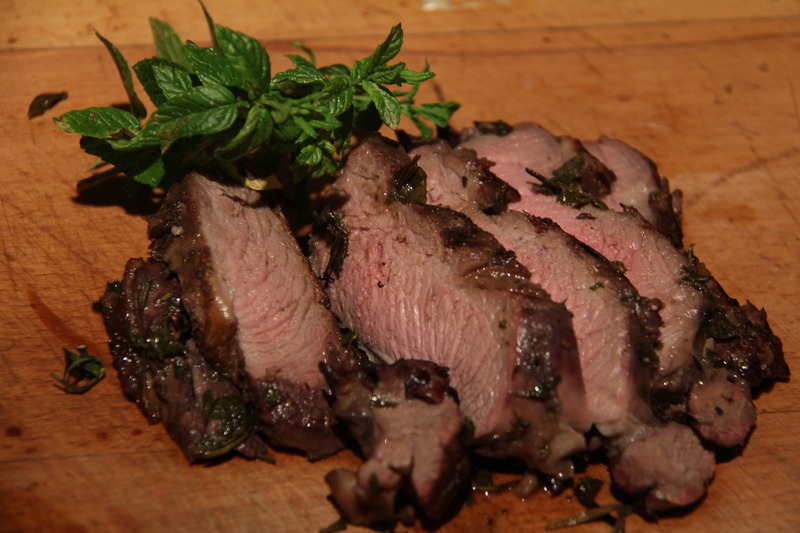 Lamb should be basted frequently with the marinade during the cooking process. Cut into thin slices and serve. This makes about 8 portions. Please comment below if you try the lamb. Feel free to send your favorite recipe. I will try it and post it on the blog to share with others.